The Pro version costs a small amount per user license in order for me to provide support and spend time adding features. Thank you to everyone that purchases Nested Layer Manager :) Please check my website for more info. Submitted by nnq2603 on Wed, 2017-01-11 06:34. Homepage of this author has been gone. It's gone. Is there any info about it? Nevermind, I found his works in GitHub up to version 3 (written in C# as a plugin instead of Maxscript). Submitted by TimHawker on Sun, 2015-07-26 02:42. Sorry you’re having problems with NLM. I’ve looked into this issue a few times, and I’m sorry to say I really don’t know why it’s happening. I’ve never been able to reliably recreate it on my machine, but a few people have emailed about the problem. 3ds Max does some really weird things with window positioning, and I’m pretty sure it is something going on with Max itself. I’m using a standard form and simply hiding it, so I don’t understand how it can create this odd behaviour. Sorry I can’t be of more help. If I do find out why it is happening, I’ll release a fix. Submitted by landrvr1 on Fri, 2015-07-24 07:48. I've installed the plugin Nested Layer Manager and have set it in my toolbar. I've also set a hotkey to open and close the manager. The problem is that when I use the hotkey the manager will open, but pressing the hotkey will not only close the manager but also flip me over to my most recently used application (like Windows Explorer, Photoshop, etc). This also occurs when I open the manager via the button or hotkey, and then attemp to close it by pressing the close X button. Submitted by TimHawker on Fri, 2014-10-24 15:40. Nested Layer Manager 3 Beta 1 Released! Submitted by TimHawker on Fri, 2014-08-15 17:16. Submitted by cecofuli on Wed, 2014-04-02 02:59. Submitted by TimHawker on Wed, 2014-04-02 00:59. Regarding Nested Layer Manager and 3ds Max 2015, please look at the blog post I have published here. Submitted by TimHawker on Mon, 2014-03-24 01:25. 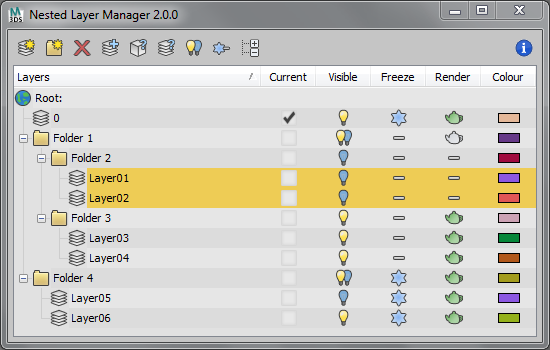 I've just released an update to Nested Layer Manager 2, with various bug fixes and new features. It is available to download from your Purchase History, and you do not have to re-activate when installing this update. For a full list of changes, please have a look at the changelog. The demo version has also been updated for those who would like to try it. Many thanks, and I really hope you enjoy the new update. Submitted by TimHawker on Mon, 2013-11-25 14:55. Submitted by fsacco on Thu, 2013-08-29 08:02.
i have another older bug. NLM hang with a red cross. i must restart max.